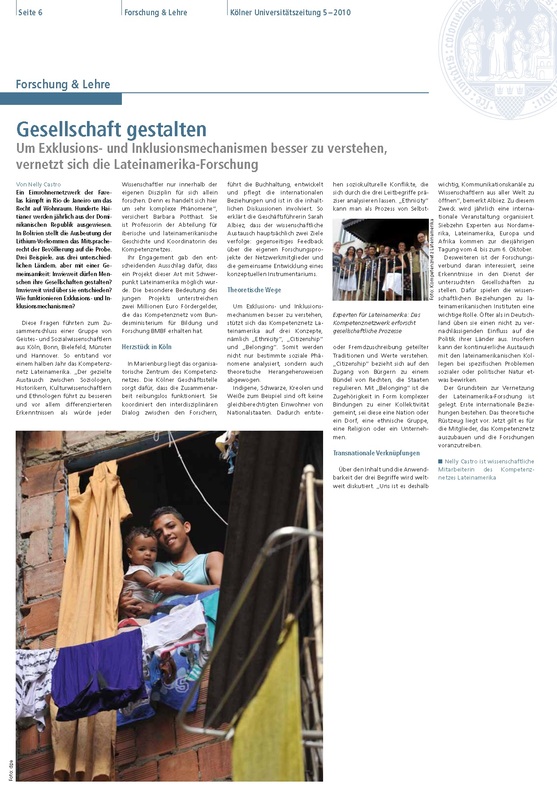 November/December 2015 Participation of the staff of the Research Network for Latin America in the exposition "Soziale Bewegungen in Lateinamerika" (Social Movements in Latinamerika) at the University of Cologne. November 5th-6th 2015 Participation by Daniela Célleri in the first conference of the working group "countries in the Andes" of the German Association of Research about Latin America (ADLAF). November 12th-14th 2014 (Co-)Organization from Barbara Potthast in cooperation with Raquel Gil Montero, Tucumán, of the Panel: "Estructuras de Familia y Migración" at the international conference "Familia y Redes Sociales. Ethnicidad, movilidad y marginalidad en el mundo atlántico", in Sevilla. September 11th 2014 (Co-)Organization from Barbara Potthast in cooperation with Pilar Garía Jordan, Barcelona, of the Panel "La representación material / visual en América Latina, siglos XIX - XXI" at the XVII international conference of the AHILA in Berlin. September 9th-13th 2014 Jochen Kemner: Organization of the Symposium "¿Desarrollo y derechos humanos como fundamentos del sistema inter-americano?" at the XVII international conference of AHILA: “Entre Espacios: La historia latinoamericana en el contexto global." July 20th- August 1st 2014 Jochen Kemner: Coordination of the IP-Summerschool "Broadcasting the Americas: Academic Reflections and Media Practice on Politics and Culture"
May 8th 2012 Participation via video-conference at the lecture „Estado, Nación, Historia y Globalización” by Dr. Pedro Pérez Herrero (University Alcalá de Henares). The lecture took place at the University of Guadalajara followed by a discussion via the video-conference. April - May 2012 Stay of Dr. Sarah Albiez-Wieck at the University of Guadalajara "further information stay" "further information lectures"